This entry was posted on Monday, April 1st, 2019 at 11:01 PM	and is filed under Ancient. You can follow any responses to this entry through the RSS 2.0 feed. You can skip to the end and leave a response. Pinging is currently not allowed. What a huge discovery, both literally and figuratively. When is the last time a Roman sculpture of this scale was found? Apparently, the Emperor died in 117 in nearby Selinus (gr: Σελινοΰς), Cilicia, now Gazipaşa, Antalya Province, in what is currently Turkey. The Alcántara Bridge in Spain, from Arabic ‘al-QanTarah’ (القنطرة), meaning “the bridge”, was built 1913 years ago, “Municipia provinciae Lusitaniae stip conlata quae opus pontis perfecerunt”, i.e. “bridging the cities of the province of Lusitania to each other”, over the Tagus river, by the order of “Imp. Caesari divi Nervae f. Nervae. Traiano Aug. Germ. Dacico Ponti f. Max. Trib. potes VIII. imp. V. cos V. PP.”, i.e. 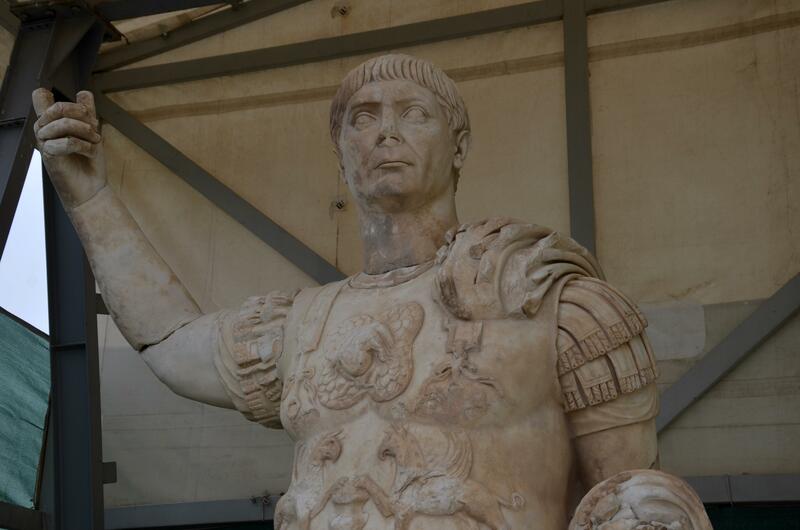 “Emperor Caesar, son of divine Nerva, Germanicus, Dacicus, TRAJAN, made highest priest and ‘bridge builder’ [‘Pontifex Maximus’], given eight times the power as Tribune power, given five times the government; Father of the Fatherland”. –Notably, that Bridge had been suffering more damage from wars than from the elements over the years. Here, contrastingly, 12 cities had apparently been made to come up for the initial bridging expenses. The prisoner is also wearing trousers which, to the Romans, was a sign of barbarism. The ‘Galatians’ (Γαλάται) were descendant of ‘Gauls’ or ‘Kelts’ (Tectosages, Boii, Tolistobogii/ Τολιστοβόγιοι, Trocmi, Volcae Tectosages of the Hercynian Forest – etc. pp.) from the Celtic settlement(s) of Southeast Europe in the 3rd century BC were also active in Phrygia –i.e. No wonder they wore trousers! Γαλατία was an area in the highlands of central Anatolia. Surely there was no Roman province of Phryria in Trajan’s day? Laodicea was in Asia, i.e.the Western Anatolian seaboard and interior, and in the region generally known as Caria. Phrygia was further north, but not an administrative area. It seems more likely to me that the captive was a conquered barbarian than a central Anatolian. What I could come up with, is a map that shows the Roman provinces in Anatolia as in 117AD with, e.g., ‘GALATIA’ and ‘LYCIA ET PAMPHYLIA’, but it might indeed be that ‘Laodicea ad Lycum‘ was not in ‘Lycia‘ itself, but close to its border in its western neighbor ‘Asia’ [..note here one of the rare occasions, where ‘Asia’ actually lies to the WEST(!)] – Indeed, no administrative Roman ‘Phrygia’. My point here, or one of them, was that by the time the ‘would-be Galatan’ invader populated the area, there was no Roman provinces in the first place. Also, I doubt that the Galatan would have seen a sign indicating ‘trespass without trousers only’, as he had already trespassed –WITH trousers– all his way from Europe. Let us hope, therefore, that he had at least one pair of trousers spare – He he. ‘Phrygia’ is a greater entity in Anatolia, i.e. it consists of connecting parts of Roman provinces of 117AD. You could even say ‘Anatolia without the coastal parts’. The Phrygians seem likewise to have come via ‘Tracia’ (also a later Roman province). Antiochos I. Soter (Ἀντίοχος Σωτήρ) died 261BC and gave Galatia to the Galatians (opposing Ptolemaios II against whom he lost in the First Syrian War, 274–271BC?). There were ‘Phorcys’ and ‘Ascanius’, who ‘led the Phrygians from afar in Ascania’, mentioned in the Iliad: Φόρκυς αὖ Φρύγας ἦγε καὶ Ἀσκάνιος θεοειδὴς τῆλ᾽ ἐξ Ἀσκανίης· -but beware- μέμασαν δ᾽ ὑσμῖνι μάχεσθαι. In Greek mythology, during the Trojan War, the region by the Lake İznik was held by Phrygians, who sent troops to the aid of King Priam, led by the two. 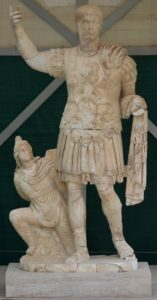 Those type of pants were referred to as βράκαι , but I would not know, if Homer mentioned any phrygian ones, and Trajan’s marble chiselling guy from 113AD might have seen them elsewhere. [Tacitus, ‘Historiae’ book 2, chapter 20.1] … ipsius municipia et coloniae in superbiam trahebant, quod versicolori sagulo, bracas barbarum tegmen indutus togatos adloqueretur. uxorem quoque eius.. [in 68/69AD, the ‘Year of the Four Emperors’ Galba, Otho, Vitellius, Vespasian].